“Founded on rock. For suffering ones and weary. A home, secure from worldly care and strife. Nature, the healing mistress, tends its portals. 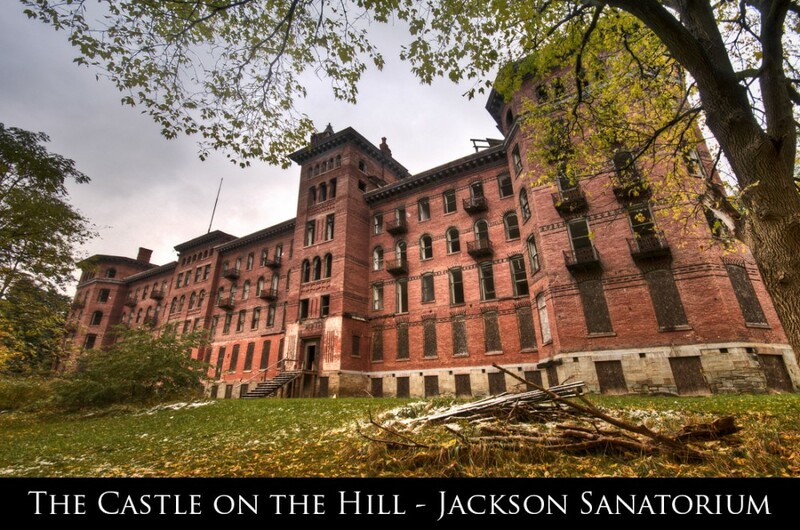 The Jackson Sanatorium was founded in 1854 by Nathaniel Bingham and was established ‘for the scientific treatment of invalid, and for the recuperation and rest in cases of overwork and nervous exhaustion.’ Jackson, ‘The Castle on the Hill’, was conducted as a Health Institution and not as a ‘fashionable resort’. 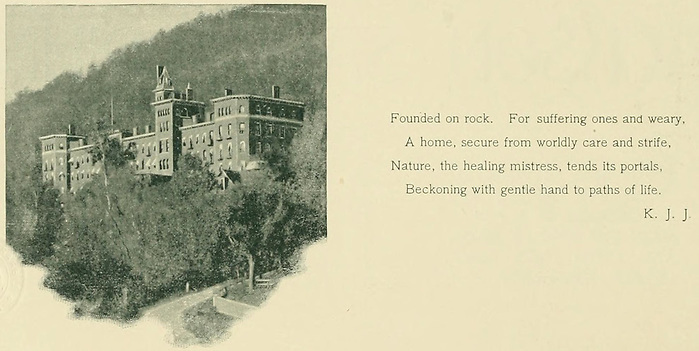 The surrounding wooded area, temperate climate, and sources of natural springs and mineral waters were what drew the founders of Jackson to that area. 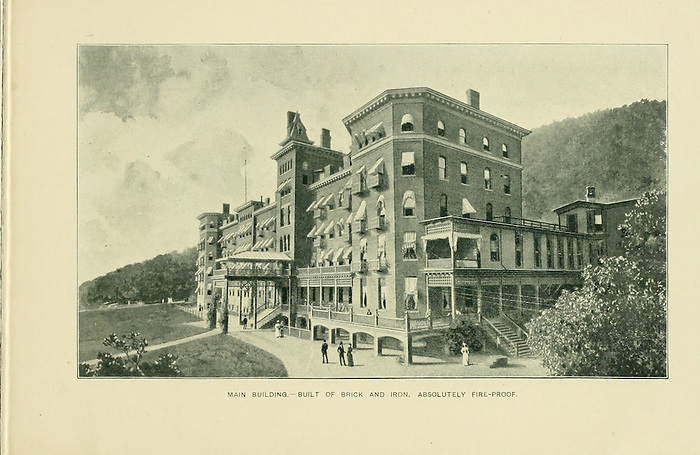 The natural mineral waters were prescribed for many kinds of chronic ailments. 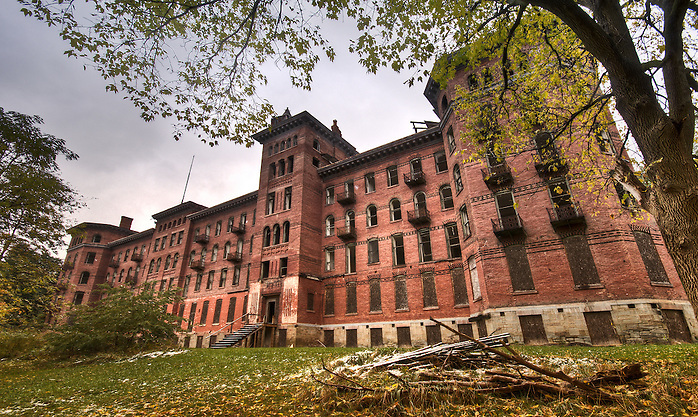 The main building at Jackson was made from brick and iron and was marketed as “Absolutely Fire-Proof. 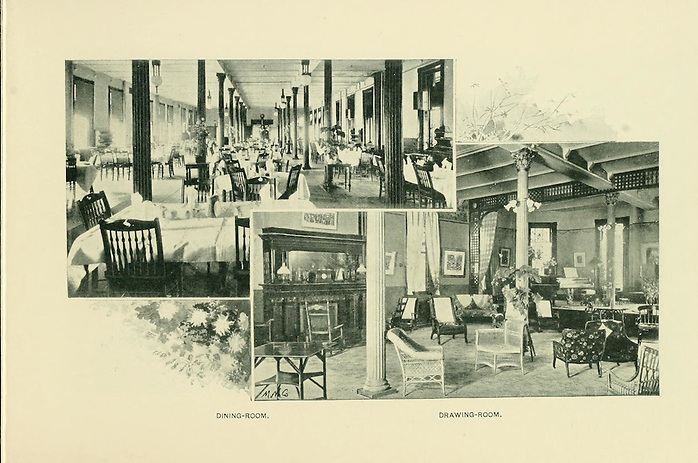 The cost of renting a room in the main building ranged from $17.50 – $35.00 per week for an individual. Jackson could accommodate only 300 guests. The morning we left, Elmira had its first snow of the year. In town there were light patches of snow on the ground, and flurries floating through the air. As we passed through Corning and Painted Post, the snow picked up and the hills were covered like “Frosted Mini Wheat’s”. We had high hopes of being able to get some snow shots at the sanatorium, but those hopes were dashed as we descended into the Dansville valley where the snow faded, and everything was just wet. We parked in a parking lot about a quarter mile from the sanatorium, and loaded up our gear. This time we remembered flashlights! We walked up the hill, ignored a no trespassing sign as we walked around a locked gate and followed a grassy path. On the way we passed several abandoned decaying houses that were slowly rotting and crumbling away. 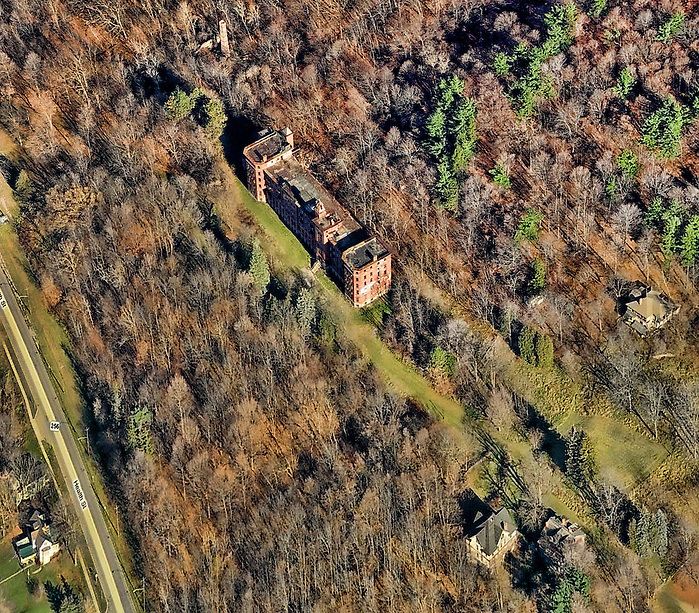 As we walked along a grass path the sanatorium came into view: a beautiful 5 story red brick building, perched majestically on the side of the hill looking down at the small town of Dansville NY. Rain drops trickled out of the sky on to us and our gear as we setup outside the building and shot our exterior shots. 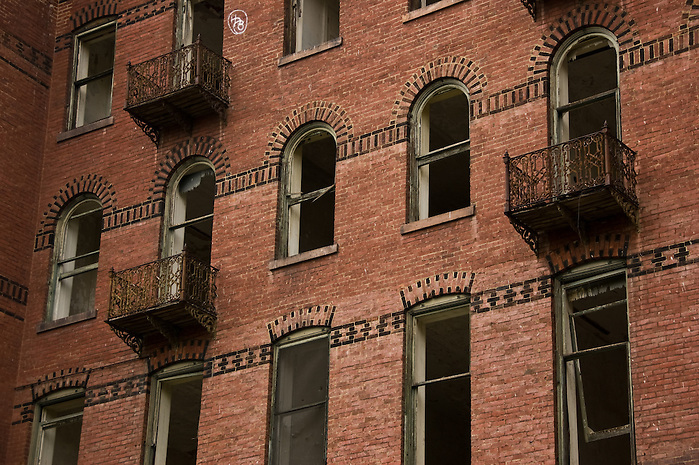 We marveled at the beautiful arched windows and wrought iron balconies that evenly dotted the outside of the building. The building was 300 feet wide, but its depth was relatively shallow, maybe no more than 40 feet. 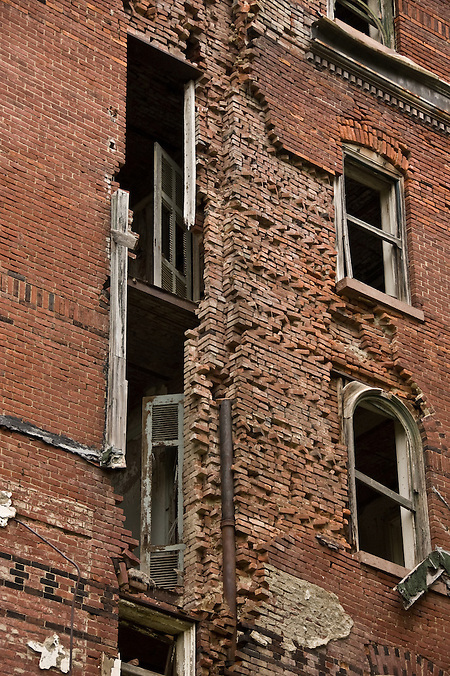 On the short side of the building we noticed a massive scar; from the fourth floor down to the second, a large gash was cut into the brick. 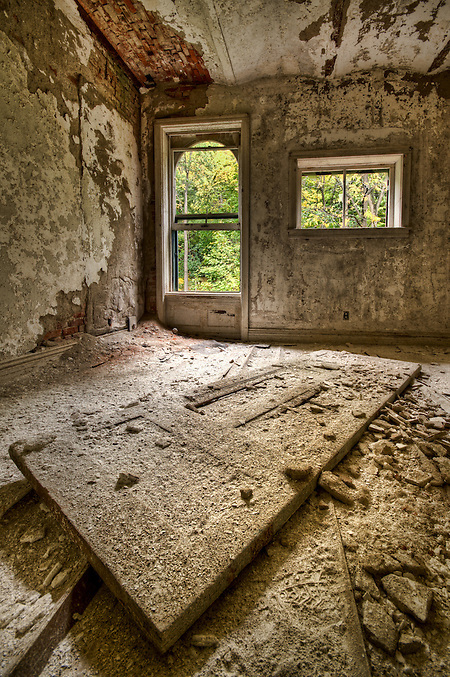 As wide as the windows and two stories tall, the wound opened up to show empty decaying rooms inside and provided an interesting glimpse into what a cross-section view of the building might look like if you sliced it in half. After making good use of our wide angle lenses, we walked up to the front door. 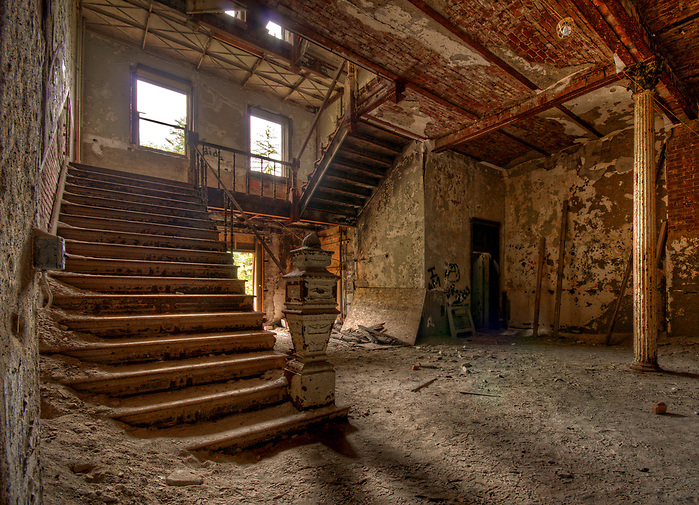 We walked up the wooden stairs and entered into the main reception hall of Jackson Sanatorium. On our right a set of stairs led downwards into the pitch black basement. 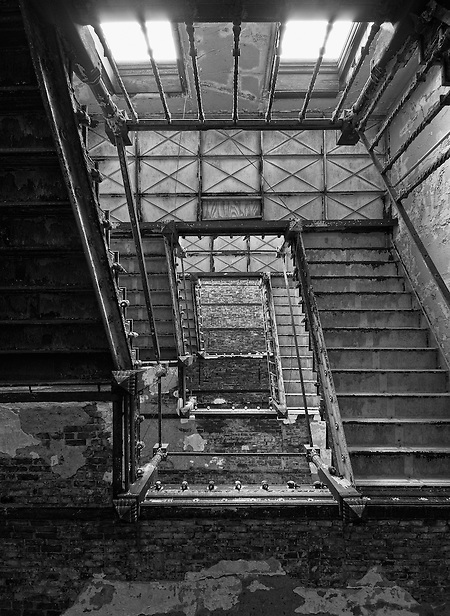 Above us, an iron railed staircase began its circling upward journey, dizzying us as we followed it up to the fourth floor with our eyes. In front of us a set of columns and arches presented themselves as remnants of what once was front desk or receiving area of the building. 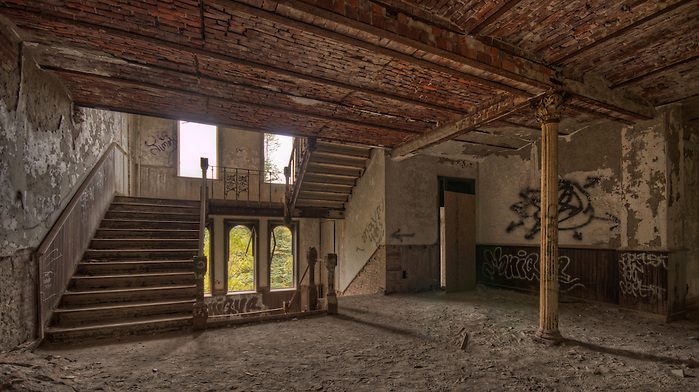 We immediately noticed that whatever material the floors may have been made out of at one time, now consisted of many inches of packed dust and dirt that revealed old footprints of other fellow urban explorers. 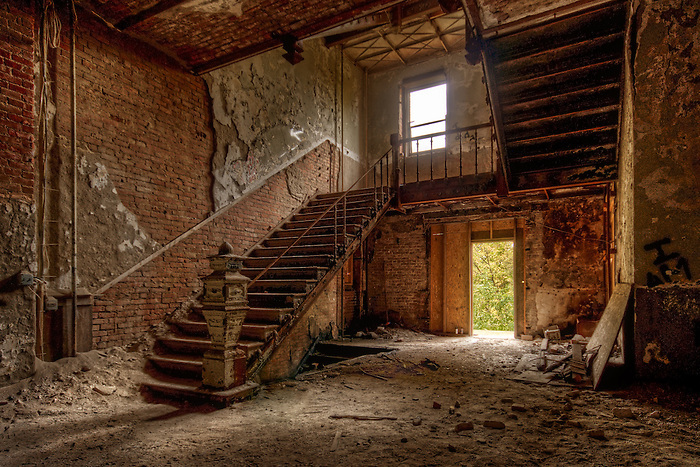 As we slowly walked around the lobby we could already taste the gritty dusty dirt that had become airborne as we paced around. We donned our masks and broke out the flashlights. 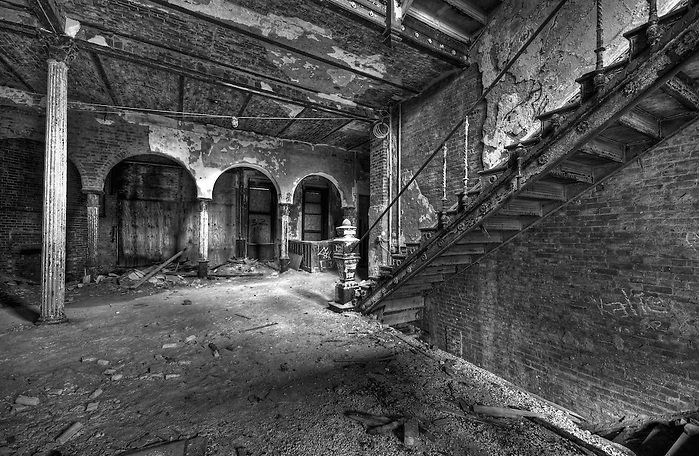 Slowly we walked down the main downstairs hall, peeking in closets and old debris filled rooms with the narrow beams of our lights. 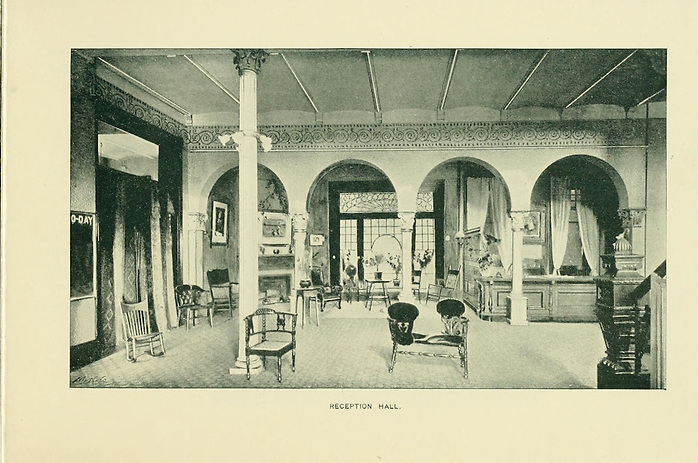 The right hall ended in what must have been a large den or community room. 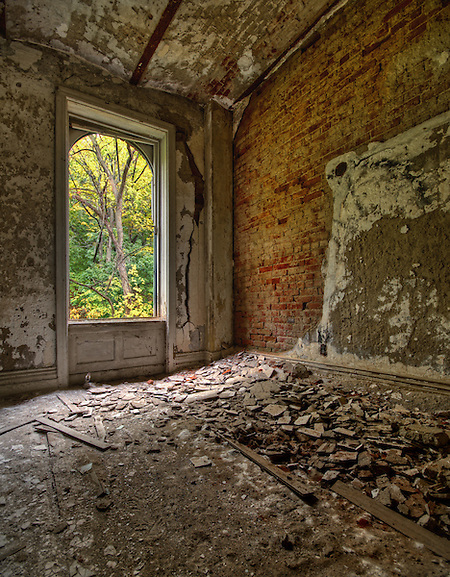 All the first floor windows were boarded up tight, only allowing slivers of dim overcast light from the outside to enter. 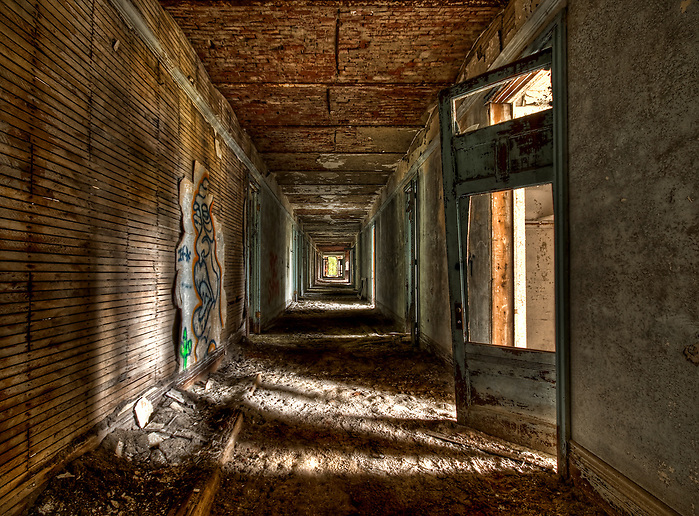 We began slowly walking down the main hall, looking in the old rooms. 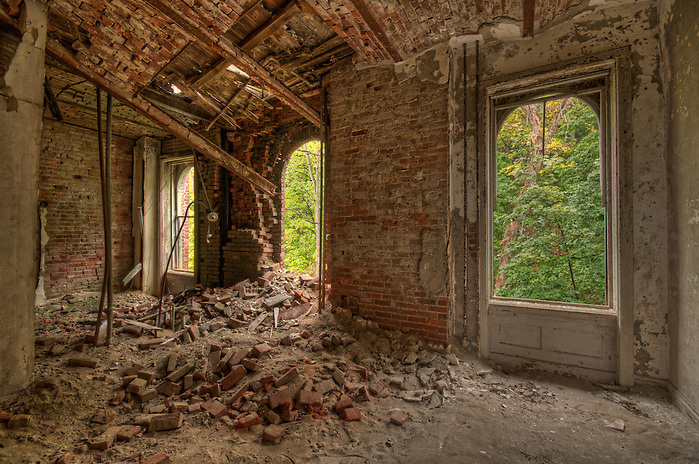 Many rooms were completely bare, some were in great condition, others looked like the floor or ceiling might collapse at any moment, and in others, the floor/ceiling actually HAD collapsed! We spent a good deal of time exploring the first three floors, shooting the beautiful decaying hallways, rooms, and objects that we found. I had seen some pictures taken from the roof so I really wanted to find a way up there. 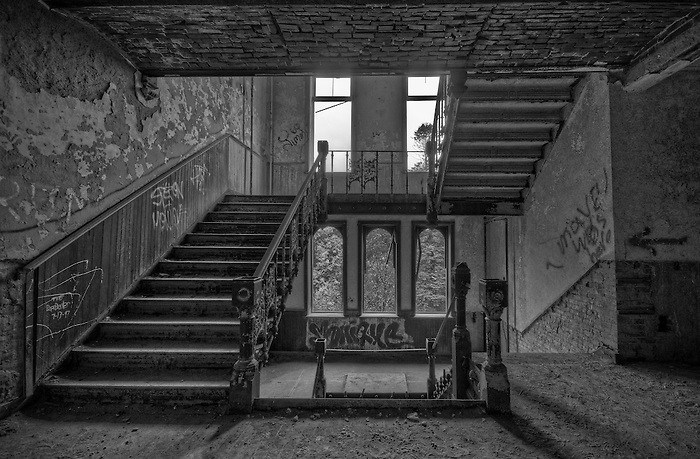 Andy stayed below and shot some more scenes while I slowly ventured up the next three flights of ever-decaying stairs. The floors of the upper level seemed to progressively get less stable. I could feel soft areas all over the place and was very careful to move slowly and spread out my body weight as much as possible. 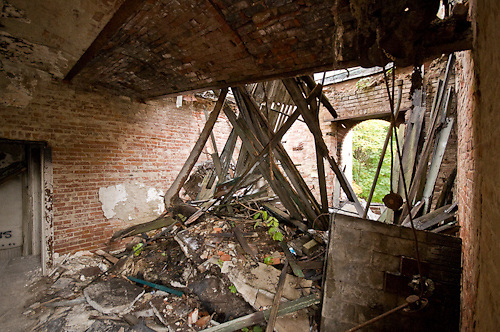 As I arrived on the roof level I noticed the significant damage of the upper level rooms. 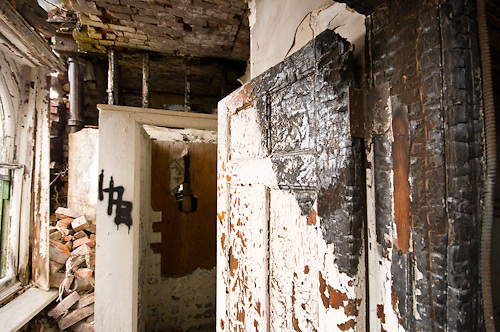 Ceilings had collapsed, walls had fallen over, and there were signs of major fire damage all around. 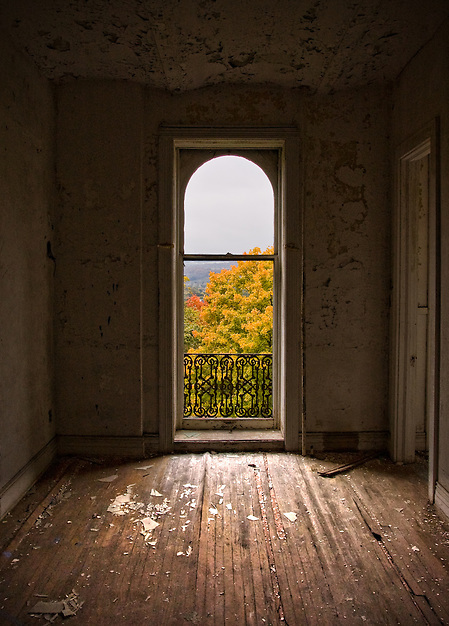 I emerged on the wide open roof and took in the breath taking panoramic view of Dansville NY. I was alone, 6 stories up on the roof of a crumbling building, and my heart was racing with excitement! After hours of shooting and exploring the abandoned hallways and rooms of Jackson, I stood on the roof feeling victorious as if I had conquered a massive giant in battle! After taking in the view I headed back down to Andy. 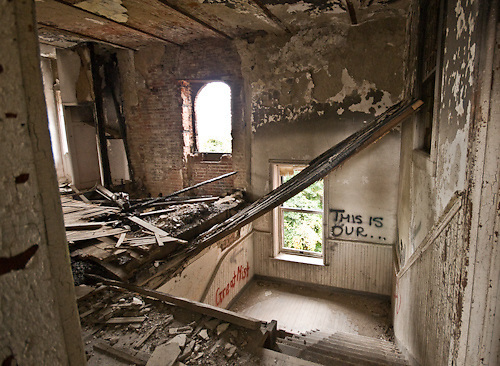 We returned to the first floor and explored the left side of the building. 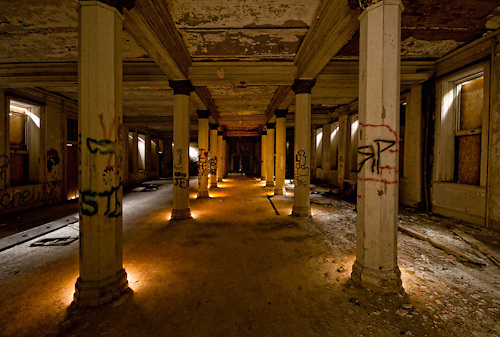 We found a very large, long room lined on both sides with pillars. This was the old dining room. Boarded up windows lined either wall allowing the smallest slivers of light to pass through into the room. We set up our cameras at the entrance to the room and just had some fun running around with our flashlights and ‘light painting’. After exploring Jackson for at over two hours, we were chilled to the bone and wheezing from the dust we had breathed in. We packed our things and headed out of the building. We walked back to our car but not before stopping to turn around, and admire once more the giant, looming ruins, of the Castle on the Hill. To view more of my work and purchase prints, head over to The Digital Mirage. My grandfather worked at the Castle on the Hill when he was young . No idea what time frame that would have been . I was able to tour this interesting site in 1992. I flew into the airport and when I saw this old building, I knew that I had to check it out. Thanks for the photographic tour, it brings back interesting memories. Please share you stories on there. I have tried to contact Peter Krog a few times via email with no response back. The Grant from the State is for $2.5m that has to be matched equally prior to getting the first $2.5m deom the state. I am aware that the grant has been extended at least twice and has been asked to be extended again. I would question why the state would extend it if nothing has seemed to pan out yet with trying to get business interested enough to move forward on any plans. Peter Krog is the fellow who bought the Castle at tax foreclosure auction. He owns Krog Construction in Orchard Park and is from a Dansville family. His dad was with Stony Brook State Park when the CCC and Transient Camps were there as part of FDR’s WPA program which put unemployed young men to work. (pre WW2). This group did the amazing stonework at the park as well as the picnic pavilion, roads etc. These fellows were then ready to go to WW2. His Mom was an area art teacher. Since the purchase of the Castle, he has renovated many other buildings, including some in Hornell and Corning but apparently has permanently turned his back on the Castle project. He is also involved in a boutique hotel venture in the 1000 Islands at Clayton. The “Castle On The Hill. What memories. I used to pay 25 cents to go swiming in the inground pool after work at “The Instructor” in Dansville, NY in the late 1950″s. In the 1970’s my husbands band played there and also the band played on the roof. It was a special place to go and dance, also to eat. Such a shame it is deserted. It stands alone with its memories in the hallways. Enjoyed your pictures very much. Brought back so many memories. Great photos! This may sound weird but , do ever sense the building communicating with you? I grew up in Dansville, and remember many days of exploration, swimming, basketball in the gym, and for a short time in the summer working at the Castle. Yes, in the late fifties we could swim in the pool(as I recall there was a charge of 25c). They had three diving boards, a high board and two low boards on each side. Spent lots of hours playing basketball in the gym, but this was all done without the knowledge of the managers of the hotel at the time. We did scrambel at times when we thought we might be found out. I actually lived in a cottage owned by the Castle in 50′ and until Feb of 51′ when we moved into our own house. There were several homes(cottages) on the grounds which in my day were seldom rented for the seasons. There were times when we would see people at the cottages, but seldom were many of them occupied. I’d guess there were as many as six fairly large cottages. 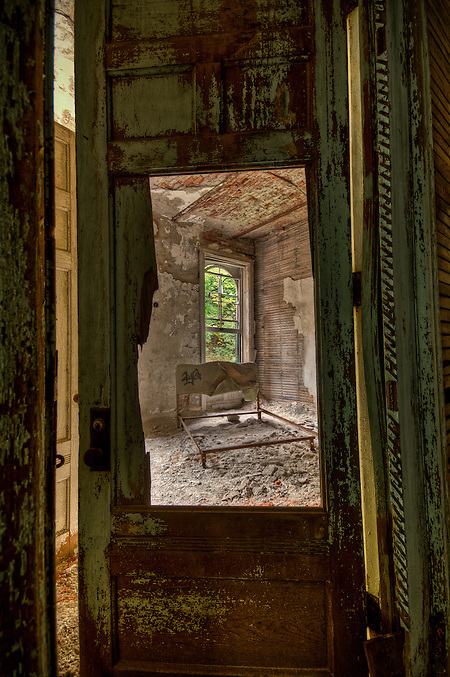 We often explored these homes in the off season, and once discovered a “homeless” very old lady who had taken up residence in one of the homes. This lady would leave the house maybe once a week, walk down Perine Street to Youkum’s grocery, buy Twinkies or the like, and return. We never tried to bother the women, and when ever we saw her in our explorations she would yell at us, and we left her alone. Hiking on the grounds, and on the East hill was another favorite pasttime. Sledding on the “cliff” just off of Health Street and in front of the Castle was great too. As far as the renovation is concerned, I am not aware that any program is in place, but I do know the guy who purchased the property. It was purchased for $45k, and the grant number we were told was 5mil. I am not aware that there is a term on the money. Hope to see more posts. This was a great place to make memories while we were young. I too as a teen had visited the Castle on our Bi-monthly call off of of work excursions to explore the southern tier. I was able to procure some souviniors. I have 2 key locks, about 10″ long. We had imagined people shackeled to the beds. Also hand painted bell shaped wall lamp glass shades that had serene scenes like deer walking among the pines,birds,streams and such. Those eventually got broken but I still have the locks 35 years later. It was strange being inside those walls and I never will forget that feeling nor that day. I too took pics and still have them. Thanks for the great shots and for sharing. 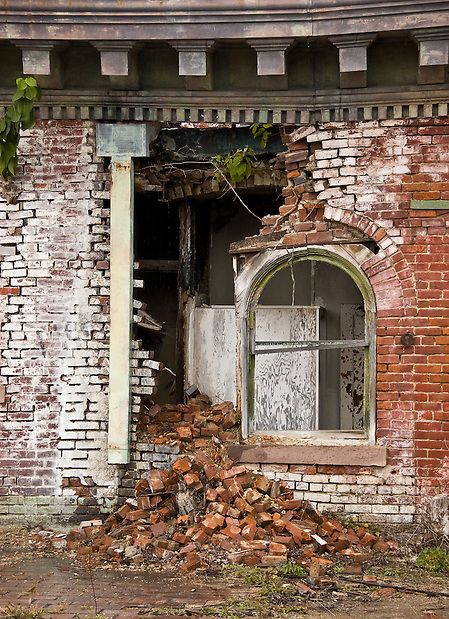 This incredible Castle continues to crumble before our eyes. I live in Dansville and just recently part of the north wall collapsed sending a bellowing cloud of smoke into the sky. A few years ago the Castle was purchased for $40,000 by an out of town contractor. His idea was to invest some of his money and fix it up, he had great ideas, not sure what happened. A grant was also received to help restore the Castle, however, if the grant is not used by the fall of this year the monies will be returned to the state and this once famous hillside Castle will be gone forever. My mother still speaks fondly of how she would make coleslaw for the dining room, my mother-in-law was a chamber maid and can remember the swimming pools and dancing on the roof top. My aunt was a hostess for the dining room , seems everyone who lived in Dansville at that time was able to get their start by working at the Castle. How sad it will be to lose this majestic building, but it does seem inevitable as plumes of smoke rise daily from sections of walls that continue to fall. I WORKED UP THERE AT THE END OF IT HAY DAY I WAS 12YEARS OLD TILL I WAS 14 I GOT 10 CENTS HR. GO UP THERE AFTER DARK AND SWIM IN THE POOL TILL THEY COUGHT US AND SEND US HOME.BRINGS BACK MEMORIES. I spent many years in Dansville, living right in the shadow of the Castle, and still have family there. 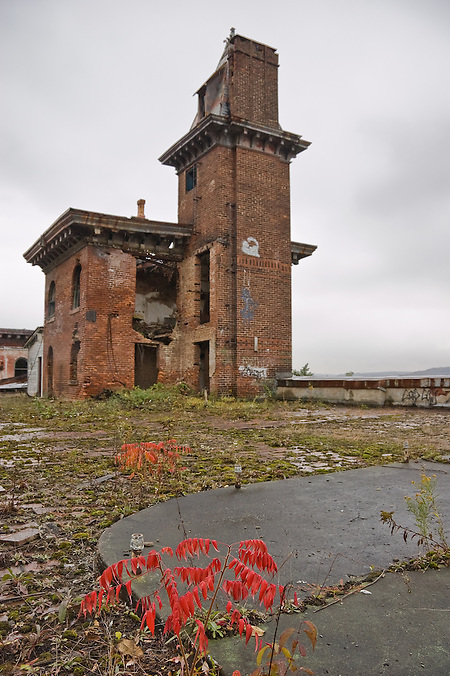 The Castle is a strange and sad metaphor for life in this small, aging, impoverished town. 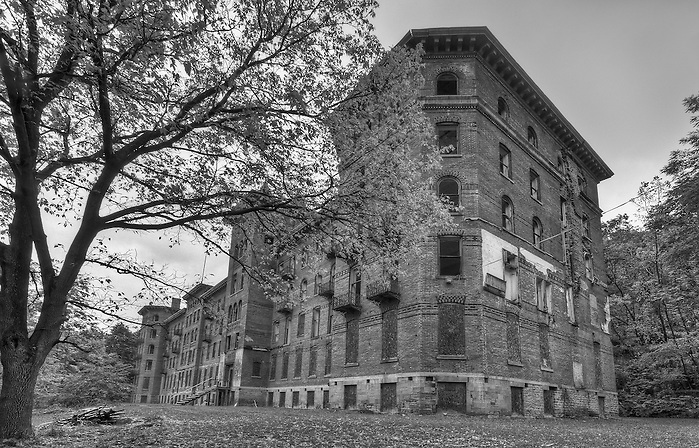 Throughout the 1980s and 90s there were constant whispers of some mad millionaire or investment group that was going to “restore” the Castle and bring excitement and tourism back the Dansville. Many people in town still remembered when the train went through town, and when the Castle was run (in her 4th or 5th incarnation) as a dance hall. But the family farm is not coming back to Dansville, nor are the tourists, anymore than the trains. Still, people look to the crumbling giant, so plainly viewed from anywhere in town, and remember. I think I’ve seen this building in a movie somewhere. Don’t remember which one but it really does look familiar. HHhhmmm……..????? Anyone? Wow incredible stuff guys. I love these old buildings. This is what I get for living in Florida. I don’t think we have buildings like you have up north. Great work. All the best. Simply awesome man…glad I found this site. My family is from Dansville and I used to visit frequently. 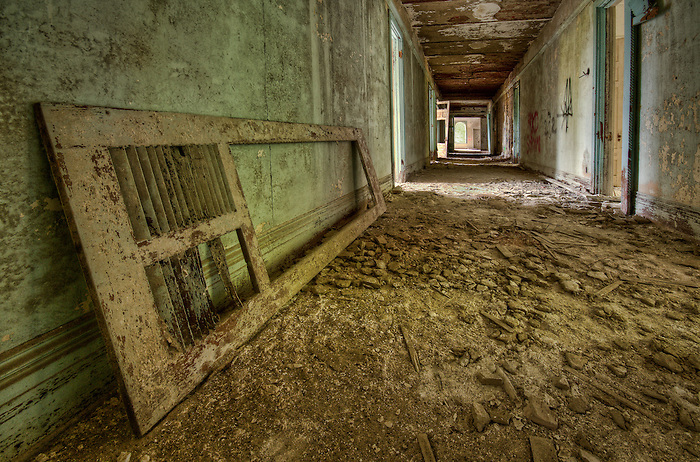 I always wished I could check out the Sanatorium – thank you so much for the pictures! Puts me in mind of the exploration of the sunken 'Titanic'. Hmmm…if 'Titanic' were a building…. Thank you for your comment Sar, I am glad you enjoyed the post. All of the historical data I got from a very old book about Jackson that was on record in the library of congress online. That is also where I got some of the pictures as well. I, too, grew up in Dansville & have been up to the castle many, many times. But I have to say you guys captured the eeriness of it with you pictures. I thought something was going to pop out at me while I was looking through the pics! =] & the old pics against the ones you took is great too. Although I'm not sure how much history research you did or got because it was a little different from what I knew growing up. AWESOME job from someone whose childhood included the castle on the hill! Now THAT was a fun ride – Thank you! Great photos! I grew up in Dansville and now live near Huntersville, NC. My mother used to work at "The Castle on the Hill" when it was being run by Bernarr McFadden. My brother took a tour of the building and surrounding grounds back in the mid 70's and took many pictures. It would be interesting to see how things have changed after so many years. I was quite young at the time of my brother's visit, but I remember seeing quite a bit of old exercise equipment still being in the building, even an old piano. I am going to send him a link to your blog and see if he can dig out those old slides to compare. I also read someplace that a $2.9 million grant was given to help shore up the building and restore it so some degree at least. Not sure of the details, or if anything will acutally come of it, but I'm hopeful. 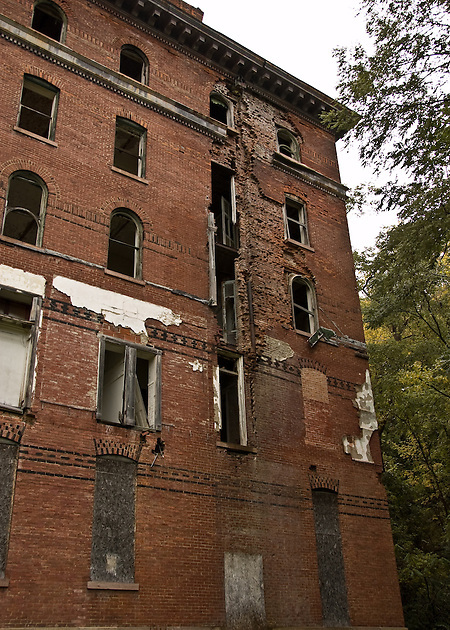 It will certainly take much more than $2.9 million to restore the building, but perhaps it would be enough to keep it from falling down and buy some more time. It's almost incomprehensible that such an amazing building has fallen into such a state. Thanks again for the wonderful images and the bravery to go up on that roof! It is extremely interesting for me to read that post. Thanks for it. I like such themes and everything that is connected to this matter. I definitely want to read a bit more soon. Awesome! Makes me want to take a trip to NYC and go there for myself! First of all – Great photos! I really like how in your past two posts, you combine original photos of the building compared to what it looks like today. That is a great way to demonstrate what is happening to these buildings. i grew up and still live in Dansville, New York where the castle is. i have never really seen the inside in daylight..i have only sneaked up at night so it was awesome seeing all those pictures!!! you did an amazing job! it is such an amazing place! i love going up there!